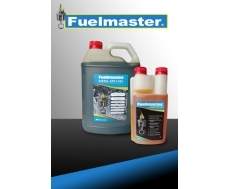 FUELMASTER is a super concentrated complete fuel treatment. Fuelmaster is a cost effective solution to managing fuel quality. Fuelmaster advanced technology help contain costs by improving fuel flow, ensuring uniform injector spray pattern, resulting in a more complete and efficient combustion cycle. Eliminates conditions for algae and bacteria growth. Stabilizes fuel and extends storage life. Removes and prevents was, gum, varnish and sludge from tank and fuel lines, thus improving fuel flow. Ensures uniform injector spray pattern. Neutralizes acids in aged fuel. Lubricates top end, fuel pumps and injectors. Reduces emissions, because of more efficient burn, lowering exhaust temperatures. Inhibits carbon deposits on piston crowns, exhaust valves, upper ring areas and turbocharger blades. Reduces the soot index in the engine sump oil, thus extending oil life. Will not damage engine or affect your warranty. Contains no harmful aromatic solvents, alcohol or metals. It is not dangerous biocide! It doesn't change the specifications for fuel as per Government regulations. Extremely cost effective, use only 1 litre per 4000 litres of fuel.